New, GM/Dodge Dana 60 8 lug wheel hubs with races, studs, and rotors. 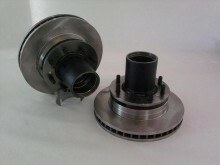 These wheel hubs are a Genuine GM product. They also include bearing races. Note: Orders outside the continental US are subject to extra shipping costs. Contact Us for more information. Click the button below to add the Wheel Hubs with rotors, GM/Dodge with Dana 60 (PAIR) to your wish list.